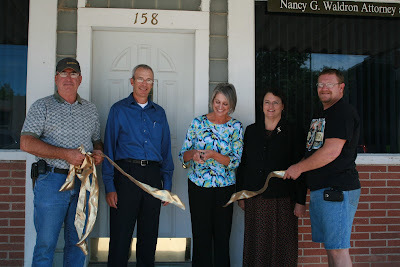 Exeter Chamber members gathered for a noon meeting and ribbon cutting on Wednesday, September 7th. The Chamber welcomed Gerri McIntyre, owner of Diet Center, to her newest branch location in downtown Exeter. Pictured cutting the ribbon from the left are Exeter Chamber members Bob Mueller, Alan Emshoff, Mc Intyre, Nancy Waldron and John Graham.